Police radio transmissions reveal the chaotic moments as two Hartford officers were shot at and returned fire at a suspect early Tuesday morning. 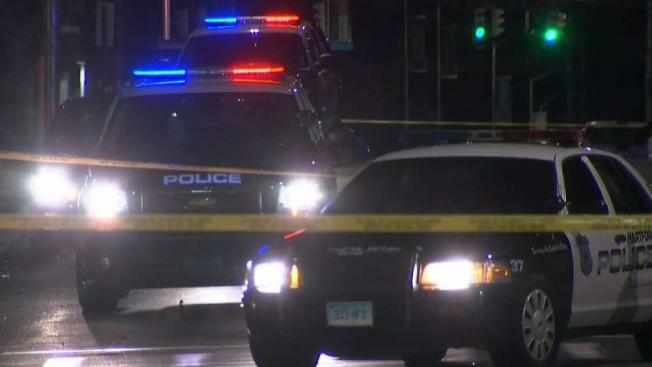 Police are investigating an officer-involved shooting in Hartford early Tuesday morning and they are continuing to look for a vehicle that fled the scene. Police said Hartford Police Officer Michael Fallon and Officer Brian Kearney were in a marked vehicle and on patrol in the area of Capitol Avenue and South Whitney Street around 12:15 a.m. when they noticed a gray four-door sedan driving erratically in the area and tried to stop it for a moving violation. The driver attempted to get away but stopped near 89 South Whitney St. and someone got out of the car and ran while a passenger took the wheel and drove off, according to police. “Either an operator or a passenger got out of the vehicle, engaged officers in a foot pursuit. An exchange of gunfire did occur at that time,” Hartford Police Lt. Paul Cicero said. The male who was running from police fired at the officers and one or both officers returned fire and hit the suspect, according to police. Officials said police took the suspect into custody and the gun was immediately recovered. "We did recover a firearm at the location of the incident, as well as several magazines and casings," Lt. Cicero added. The suspect was taken to the hospital to be treated. Connecticut State Police said he was hit in the leg several times and was in critical condition as of Tuesday morning. The officers involved were also taken to the hospital, but police said they were not hit by gunfire. A man who lives on Amity Street and heard the commotion described the scene. “Me and my wife were woken up with gunshot fires. We knew they were gunshot fires. They were relatively close, so when I looked out the window I did see a lot of activity," said Jose Morales. "It's unnerving, really, everything that's going on in the city. We just hope and pray that everything just falls back in place," Morales added. Connecticut State Police are leading the investigation and Hartford Internal Affairs and Major Crimes are also involved. Police are looking for the vehicle that fled the scene.